Sho Foo Doh aka Japanese chef Fumio Tanga is bringing is Okonomiyaki to the Institute of Light in London Fields for a 6 month run, starting Wednesday 17th October 2018. It will be serving 4 nights a week - Wednesdays to Saturdays - don't miss this great and authentic Japanese cuisine! 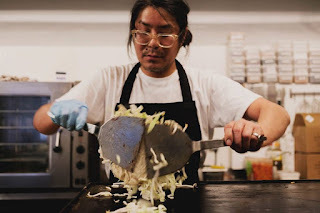 "Chef Fumio Tanga and his Okonomiyaki "松風堂/Sho Foo Doh" team present unclassic Japanese snacks + Hiroshima style okonomiyaki four nights a week from Wednesday to Saturday, 6 'til 10pm. “There are a few different okonomiyaki styles in different regions in Japan. The most popular and well-known one worldwide is the Osaka-style, which is a more doughy pancake where all the ingredients are mixed into the batter. Hiroshima-style on the other hand is more layered, starting with a thin crepe, loads of vitamin K boosting cabbages, beanshoots, pork belly, egg noodles and an omelette, with sauce, mayo, benishoga ginger and scallions on top.” Fumio Tanga"